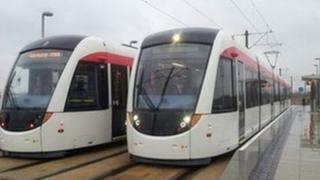 Edinburgh residents will get a better look at the new trams this week when daytime testing begins in the city centre. Currently trams are only running through the city centre during the night, and just between Edinburgh Park and the airport in the daytime. The city council said it is on target to get the trams fully operational for the public by May. Testing is aimed at helping pedestrians and drivers get used to the vehicles. In advance of daytime testing getting under way, the council and Transport for Edinburgh have produced a series of videos and tips as part of a wider awareness campaign to increase public safety on the tram lines before they open. Edinburgh's transport convener, Councillor Lesley Hinds said: "Up until now, trams have only been running at night when the city centre roads are much quieter. "Daytime tests aren't far away and it'll take some time for people to get used to seeing trams running on streets so we're asking drivers, pedestrians and cyclists to take extra care while everyone becomes familiar. "It's also the right time to remember some straightforward but very important safety messages." Edinburgh trams director and general manager Tom Norris said staff had been training "extremely hard". "We're now ready to move into a phase where many more trams start to run along the route," he said. "Safety is our first priority and our drivers are all fully aware that other road users need time to get used to interacting with the new trams. Our main message is that trams are big and quiet so give them space, look before you cross the road and listen for the bell." The testing phase will eventually see multiple tram test journeys along the full line over the course of the week. The daytime tests are not timetabled but an update will be provided in advance of the first full route daytime test on the Edinburgh Trams website, as well as through social and local media.